Description: House/Villa For Sale In The Municipality of Dobrich. 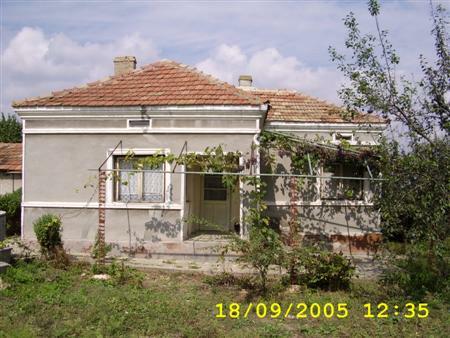 Rural Bulgarian house in the village just 6 km away from Dobrich and 55 km away from the town of Varna and airport. The village is situated in countryside region extremely suitable for fishing and ecotourism. There is a lake nearby. The village has shops, kindergarten, school, pubs and a church. The house is a brick build and comprises: 3 rooms, a bathroom with toilet, a cellar, outside toilet and some agricultural outbuilding which could be turned into a guest house. The house is kept in good conditions. Telephone line, Internet and cable TV are available. The property is easily accessible by an asphalted road. The garden is 1800 sq m with vineyard and fruit trees and it is large enough to have swimming pool. The area is quite picturesque. Regular bus transportation to Dobrich. Several English families live permanently in the village. This is a wonderful village property, suitable for a holiday home or for a full-time residence after some cosmetic repairs!